John Winslow Irving (denaske John Wallace Blunt, Jr. la 2an de Marto 1942), estas usona romanisto kaj scenaristo kiu ricevis Oskar-premion. Irving ricevis kritikan kaj popularan akceptadon laŭ la internacia sukceso de The World According to Garp en 1978. Kelkaj el la romanoj de Irving, kiaj The Cider House Rules (1985), A Prayer for Owen Meany (1989), kaj A Widow for One Year (1998), iĝis furorlibroj. Kvin el liaj romanoj estis adaptitaj al filmoj. La agado de kelkaj el la libroj de Irving (The World According to Garp, A Prayer for Owen Meany, A Widow for One Year) kaj mallongaj noveloj okazas ĉe la Phillips Exeter Academy en Exeter (Nov-Hampŝiro). Li ricevis Oskar-premion por Best Adapted Screenplay (plej bona adaptaĵa scenaro) en 1999 pro sia scenaro por la fimo The Cider House Rules. ↑ . 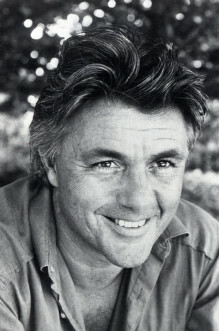 While Excavating Past, John Irving Finds his Family. The New York Times (28an de Junio, 2005). Alirita 10an de Septembro, 2014. John Irving interviewed de Jonathan Derbyshire ĉe New Statesman pri "Last Night in Twisted River"
Ĉi tiu paĝo estis lastafoje redaktita je 18:58, 9 feb. 2019.